Philatron Wire and Cable is happy to announce the launch of its new website. It’s Philatron's sincere desire to improve user friendliness and appeal. The changes have new and improved functions, design, presentation, and information. One of Philatron's main goals was to help visitors get to know Philatron better and get a strong feel for Philatron Wire and Cable, by using a responsive design compatible with smartphones, tablets, and desktops. As always Philatron strives to provide visitors with clear and accurate product service information, and to demonstrate its expertise by providing manufacturing solutions with undeniable value. Aside from being aesthetically pleasing, Philatron's new website is more interactive, and is easier to read and navigate, enabling visitors to find what they need quickly. Just as importantly, Philatron's key messages and value propositions are both evident and clear. 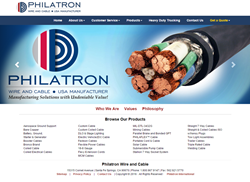 A leader in technology, creativity and innovation, Philatron Wire and Cable is a major wire and cable provider in the USA, manufacturing a full range of wire and cable products. Philatron is an industry leader in manufacturing, design, development, technology, and marketing, with over 40 years of service. Philatron values core competencies offering copper drawing, roping, cabling, extrusion, injection molding, coiling and assembly. Philatron supplies power to a multitude of industries including the OEM market, automotive, mining, heavy-duty trucking, aerospace, construction, military, custom cable, and cities around the world. Manufacturing Solutions with Undeniable Value!